Glitter, glamour and pink champagne! 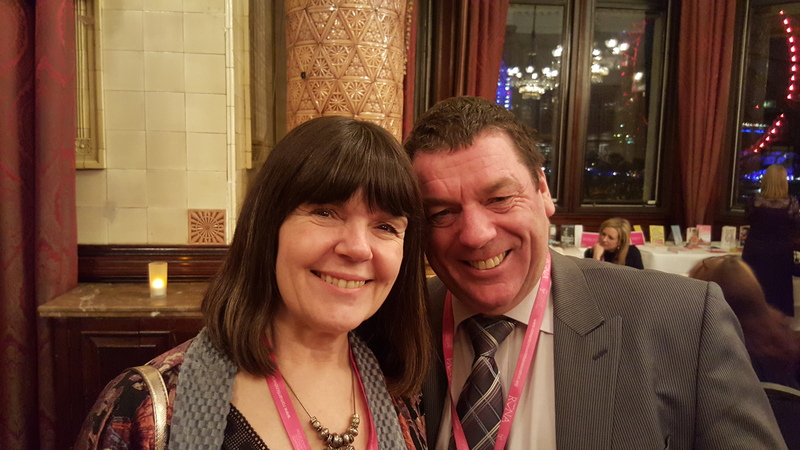 On 7th March – which also happened to be our 7th wedding anniversary – my DH, Ian, and I set off to London to attend my first ever Romantic Novel Awards (RoNAs). Even more exciting than attending the most prestigious event in the RNA calendar was that my second published novel, From Wallflower to Countess, had been shortlisted for the RoNA Rose, which celebrates the best in shorter or category romance. We parted company at Euston, as I had a lunch date with my publishers, Harlequin Mills & Boon, together with their other shortlisted authors: Annie O’Neil, who writes for the Medical series, and Scarlet Wilson, who writes for Cherish. The lunch, at the glamorous Northall restaurant in the Corinthia Hotel, was hosted by Joanne Grant, HMB senior executive editor, and was also attended by each shortlisted title’s editor – including my editor, Julia Williams – and other senior editors. The Corinthia Hotel is just around the corner from the Gladstone Library where the evening ceremony was to take place so, after lunch and a quick change, Annie, Scarlet and I made our way to the Gladstone as we had been asked to arrive early for photos to be taken. 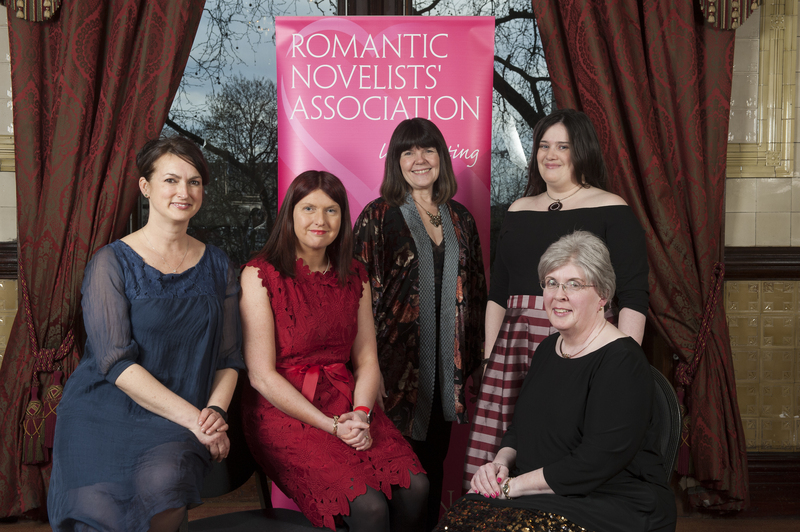 The two other authors shortlisted for the RoNA Rose award also arrived early – they are both Choc Lit authors: my good friend and fellow Anti Doubt-Crow, Alison May, and Angela Britnell – and then there was nothing left to do but partake of the free champagne until the event kicked off at 6.30. Ian arrived in time for the evening party, and he sneaked into the main room to take a photo of the Library which provided a magnificent backdrop for the actual awards. It was lovely to meet up with friends old and new and, as ever, the noise rose to near-deafening levels as more and more romantic novelists (not all women, by any means!) arrived. 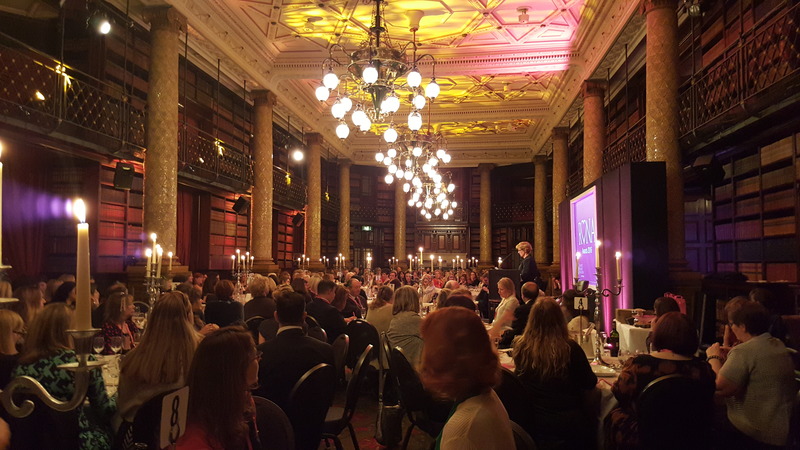 The ceremony – full of glitter and glamour, with pink champagne flowing – was introduced by the RNA chair, the very charming Eileen Ramsay and compered in her usual entertaining style by the inimitable Jane Wenham-Jones, with Fern Britton in attendance to present the trophies. Well, reader, I may have failed in my first attempt at bringing one of those beautiful crystal stars home, but I consider myself a winner to have been shortlisted amongst so many talented writers. The very lovely and very funny Annie O’Neil triumphed in the RoNA Rose category with her medical romance Doctor… to Duchess? 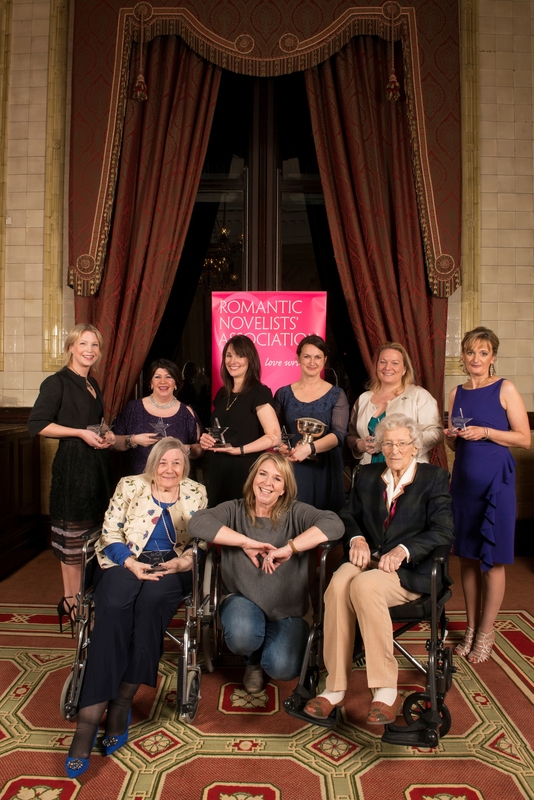 Two amazing authors were also honoured with Lifetime Achievement Awards, and they are pictured at the front of the photo: Anita Burgh and Claire Lorimer, flanking guest presenter Fern Britton. The overall winner of the Goldsboro Books Romantic Novel of the Year 2016 was Letters to the Lost by Iona Grey. I can’t wait to read it, and all the other winning titles too! I must include my appreciation of all the people who worked so hard behind the scenes to make a success of the evening. I will not attempt to name them, as I’m certain to miss someone out, but they know who they are! And I also wish to add my thanks to my publishers, Harlequin Mills & Boon, not only for inviting me as their guest on the night (and not forgetting that delicious lunch!) but for taking a chance with an unknown writer and helping me realise my dream of becoming a published author. Without them, I would not have been in that shortlist on Monday night! It was an evening to treasure, made more special by having Ian by my side – the first time he has attended an RNA event. I hope it won’t be the last. This entry was posted in Awards, Romantic Novelists' Association and tagged Alison May. Andela Britnell, Anita Burgh, Annie O'Neil, Choc Lit, Claire Lorimer, Eileen Ramsay, Emma Hannigan, Fern Britton, From Wallflower to Countess, Goldsboro Books, Ian Preston, Iona Grey, Jane Wenham-Jones, Joanne Grant, Julia Williams, Lucy Inglis, Melanie Hudson, Mills & Boon, Milly Johnson, Romantic Novel Awards, Romantic Novelists’ Association, RoNA Rose, Scarlet Wilson. Bookmark the permalink. So exciting! What a wonderful anniversary! It was, LIz – both exciting and a wonderful anniversary!